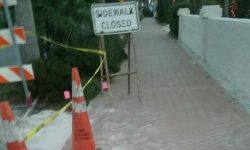 No explosions from pierced gas lines reverberated through Siesta Village the week before Thanksgiving, but the construction crew laying fiber optic cable for an MCI cell phone project did manage to strike a sewer pipeline beside the Terrace East condominium complex, as reported in the November Siesta Sand. On the morning of Nov. 17, Lisa Cece, the special district coordinator for Sarasota County who supervises Village upkeep, reported to representatives of the Siesta Key Village Maintenance Corp. that crews worked through Nov. 16 and up until 6 a.m. on Nov. 17 to replace 30 feet of sewer pipe damaged by the boring alongside the driveway into the Terrace East property in the Village. That day, she continued, 30 feet of stormwater pipeline also was to be replaced. Her timeline proved a bit too optimistic. The new concrete for the Terrace East driveway finally was poured on the morning of Dec. 8, Cece reported. Then, on Monday, Dec. 11, the brick pavers were installed. The saga of damage actually began on Nov. 15. Early that morning, during his routine check on the Village, Shay reported that he noticed the crew laying the cable had dug up one of the planting beds at the Michael Saunders & Co. real estate office on the north end of the Village. That day, Cece responded that Vasi & Associates employees already were repairing the water line for the irrigation at the plaza. She also pointed out that she had turned off the Village irrigation system and had called the firm that handles it, so it could send out employees for a thorough inspection. A pull box, is the central location for all the connections for a system. The crew laying the fiber optic cable also dug into Maintenance Corp. irrigation lines by Terrace East and at the Key Corners Center, Cece and Shay reported. On the afternoon of Nov. 29, Cece had sent a third email that day to Desiree Doiron-Wilde, the project manager for Overland Contracting of Tampa — which was overseeing the fiber optic cable work — as well as to Vasi & Associates. She had attached photos of the severed irrigation lines, “mashed plants, a small destroyed tree [and] erosion of the walkway” at Terrace East, in an effort to spur promised repairs. According to Cece, the contractors for the cable project were obligated to ensure everything was restored to its pre-construction appearance and operating level. Until the irrigation lines were functioning again, she pointed out, plants could not be watered, and without the watering, the plants that were damaged “may not survive.” If the repairs were not expedited, she continued, she would send a bill to the companies, so they could reimburse the Maintenance Corp. for new plants. Finally, on Nov. 30, Cece stated that she had heard from Vasi & Associates about its plans to correct the “deficiencies from the project work,” as she put it. Shay would meet with that supervisor after the repairs have been completed, to make certain all had been done correctly, she added. The construction crew also damaged a Village garbage can when the crew used heavy equipment to try to move it; the can is bolted to the concrete. Additionally, Cece noted, sod was placed at Terrace East and at the Michael Saunders & Co. office. “I have requested that be removed,” she continued and — as she had discussed with the contractor’s crew — that cocoa mulch disturbed or lost from the digging be replaced. “We do not have grass in the landscape beds,” she pointed out, so she was surprised that Vasi & Associates had put any at Terrace East and the Michael Saunders property. At last, during the week of Dec. 4, Vasi & Associates sent a crew to Siesta Village to repair the irrigation lines and other problems. “I hope the damaged, smashed plants will respond and recover,” Cece said, since regular watering could begin again. In spite of all that transpired in the Village, Cece kept her generally upbeat attitude. In one email, she pointed out, “On a positive, all the streetlights were on and looked nice. The Village segment was just the first part of the plan. Work continued along Beach Road south. The end point is at The Anchorage just before Stickney Point Road. The tentative timeline called for the project to be completed by the end of December.